Summer came early to St. Louis this year – as it seems to have arrived everywhere. We went from sweater weather to BOOM NINETY DEGREES, shortly after I got back from Switzerland. 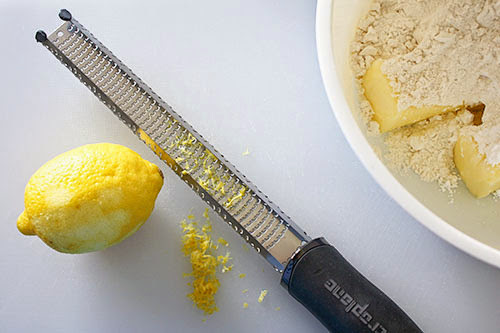 And it was during those nearly-triple-digit days that I saw this post for cherry lemon pie bars from Joy the Baker. She was also battling those crazy-hot early days of summer (worse than here!) and I was all about her cool, citrusy treat. I didn’t have cherries on hand, but I did have a bag of frozen blueberries leftover from juice cleansing. They seemed like they’d be a delicious substitute, and they were. 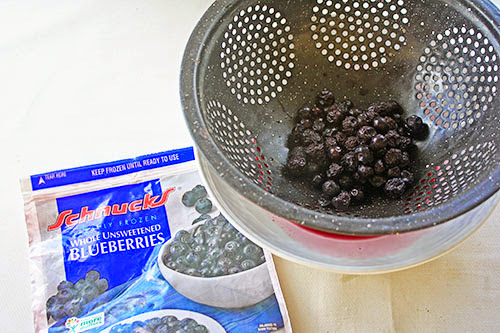 Of course, you can use fresh blueberries if you’re not trying to clean out your freezer like me. Also, I’ll be honest up front: I bookmarked Joy’s recipe, bought all the ingredients to make it, and nearly had it in the oven before I realized I’ve already made something exactly like these. Yes, these lemon bars I made over two years ago with my miraculously incorruptible oats are remarkably similar and use way fewer ingredients. BUT, Joy’s version doesn’t have that cloying taste from sweetened condensed milk, and the crust isn’t oat-y (just the topping). Both are great! Just go with whichever sounds better to you. Since I was doing things the right way with Joy’s recipe, I got a real lemon like a big girl and zested it. Apparently you only need one teaspoon, but I zested the whole dang thing. 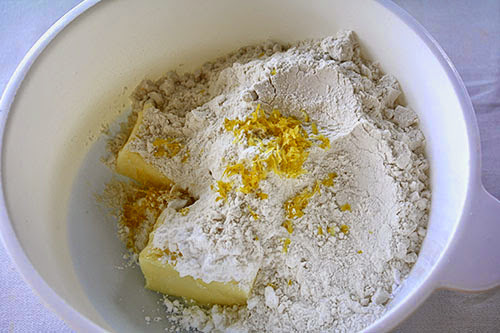 Then I added the zest to the crust ingredients: 1 1/2 cups of flour, 3/4 cup of powdered sugar, and 3/4 cup of softened butter. Despite all of Joy’s reasons why bakers use unsalted butter, mine’s salted. Just leave out the extra salt. Whatevs, it’s fine. We’re not real food bloggers. Anyway, this crusty mixture is stirred until barely combined, then a half cup is removed. That’s going to be the topping. To that, I added 1/2 cup of oats. 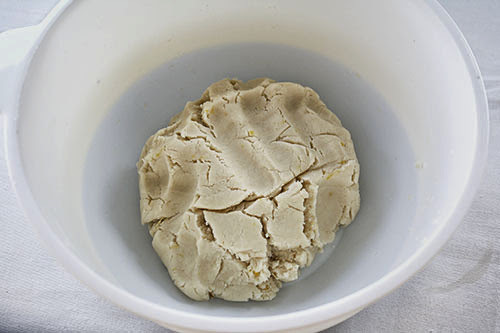 Then stirred the remaining crust ingredients until they formed a ball. It seemed to take forever and I was pretty sure I’d forgotten to add some key ingredient. Just keep stirring. You’re building your arm muscles! 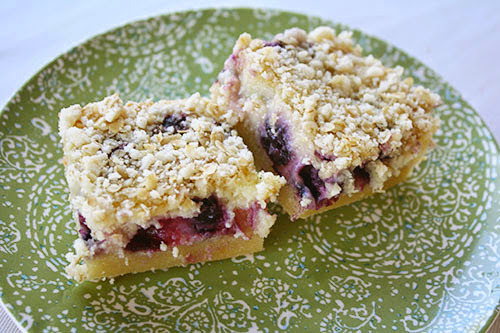 And burning calories that you can replenish by eating these pie bars! 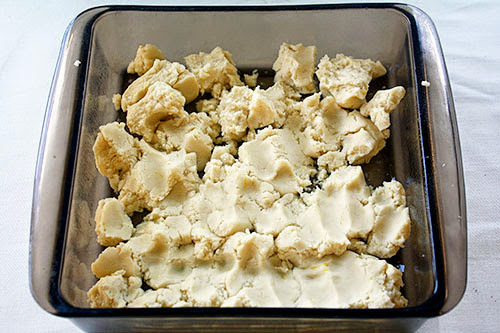 Then I transferred chunks of this pie crust into a greased glass pan, unlike the parchment-paper-lined metal pan that real food bloggers use. What can I say? All my other 8x8 pans were occupied and I think parchment paper is a dirty sham. We do what we do around here. 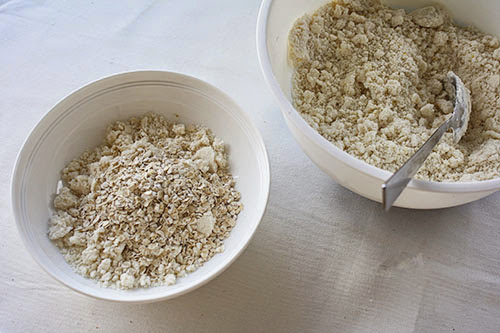 Press the crust down into the pan and bake it in a 350-degree preheated oven until it’s brown around the edges. Or... until 20 minutes has passed and you’re pretty sure you’re still doing it wrong, as the recipe said it’d take 12-15 minutes and yours isn’t browned yet. Whichever works! In the meantime, make the filling. This is way more detailed than a can of sweetened condensed milk and lemon juice! 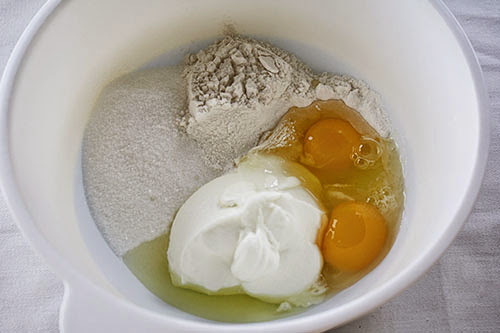 We need 1/3 cup flour, 3/4 cup sugar, 1/2 cup sour cream, two eggs, the juice from half of that lemon (2 tablespoons, give or take), and a 1/4 teaspoon of salt. Then it’s time to drain the previously frozen, now thawed blueberries. I drained them into my white wedding china, which was not the smartest thing I’ve ever done. Fortunately there were no lasting stains, sheesh. 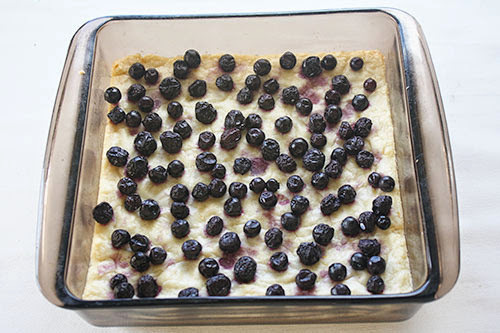 Once the blueberries were drained and the crust was baked, I transferred the berries one at a time to the crust, leaving behind as much of the juice as possible. 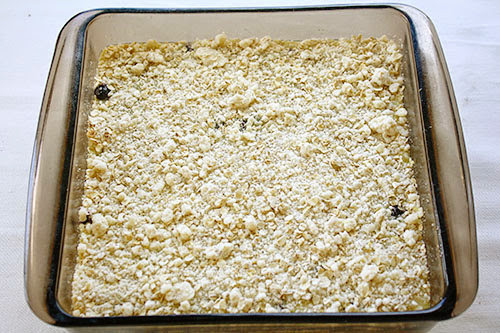 Then I poured the filling mixture over that, and added the oat-y topping over that. Then bake again! Another thirty minutes will do. Perhaps it’s cruel to run the oven when it’s so blazing hot out, but because the pan size is smaller, this can totally be done in a countertop toaster oven if it has a convection setting. Either way, chill them before serving. This is a treat best enjoyed cold. There’s a reason I accidentally made two different versions of this recipe – they’re delicious. As I said, Joy’s recipe is more work, but the taste is worth it if you’ve got the time. It’s a delightful summertime dessert for company or for yourselves. Enjoy! Hope your Monday is getting your week off to a great start, dear readers!